NEET 2019 Application Form: NEET 2019 will be conducted twice in a year in February and May Session. For February session the Application form will be available probably on 1st of October 2018. The Application Form will be available only through online mode on the official website. NEET is probably the most popular Medical Entrance exam of India. Almost all the University and state level Entrance Exams are merged into it. NEET Score card will be considered in admission in most of the colleges. 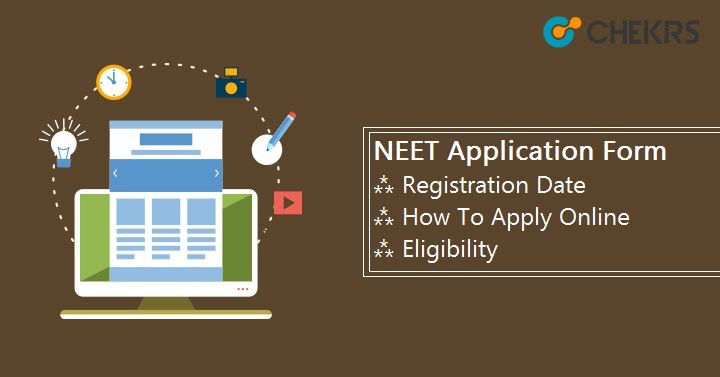 So due to its importance, we have decided to explore and provide more detailed information about Application Form, Eligibility, and NEET 2019 Registration Procedure to apply for NEET exam. Dates for NEET 2019 February Session has been already announced by newly-formed National Testing Agency (NTA). According to it, NEET 2019 Application Form will be available on 1st October 2018. Dates for May Session included here but it is tentative. These dates will be updated after the final announcement. All the Candidates need to fulfill NEET UG Eligibility Criteria which are listed below. If candidate found not eligible for it, their Application Form will be rejected. Indian Nationals, NRIs, OCIs, Persons of Indian Origin (PIOs) and Foreign Nationals are eligible to appear in NEET Exam. Candidate must be obtained minimum 50% marks in Physics, Chemistry & Biology subjects in class 12. For SC/ST, minimum 40% marks will be required in class 12th. Candidate’s minimum age should be 17 years as on 31.12.2019. Maximum age should be 25 year. There is 5years age relaxation for SC/ST/OBC Candidates. The Complete procedure to Apply for NEET 2019 Application Form is divided into 4 Parts i.e. Now we are explaining each step below. Read all details to know How to Apply NEET 2019 Application Form. Visit the official portal in between NEET Registration Date. Login Using “Candidate Login” link. Fill the Registration form first. After registering, the password will be generated and send to your mobile no and also on mail inbox. Fill the application form like personal details, educational qualification, address, etc and then choose the exam center. Now After Filling all the details, Upload Recent Photograph and Signature. Make sure that Photograph and signature have to be Recent and clear. Size and other details are given in the above table. After uploading the scanned image pay the fee using the Payment Option. NEET Application Fee is Rs. 1400/- for UR, OBC, and Rs. 750/- for SC/ST/PH candidates. You can pay the fee only Through Online mode i.e. net banking, debit/credit card, UPI, and E-wallet. After successful payment take a Print out of Payment Receipt as a proof of payment. While finally submitting the NEET 2019 Registration Form/ Application Form make sure to take a print-out of the confirmation page and also of dully filled Application Form. In this article, we have provided all the information about NEET 2019 Application Form for UG courses. There are some Changes in NEET 2019 and we will try to make all the information Up-To-Date as relative to the Official News and Notifications. Keep Visiting and Do well.